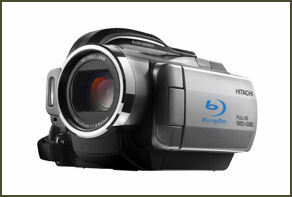 Hitachi blue ray camcorder Hitachi is the largest electronics company in terms of sales and the largest private-sector employer in Japan with 320,000 employees. It is comprised of 1,200 group companies that are involved in everything from making light bulbs, chips and computer hard drives to car parts, nuclear plants and heavy machinery. Hitachi is based in Hitachi, a factory town 150 kilometers northeast of Tokyo in Ibarkai Prefecture. It was founded by Namihei Odairi, the developer of Japan’s first domestic motor in 1910. Hitachi makes power plants, parts for power plants, trains and home appliances. It supplies train cars to the British section of the Eurostar and established an alliance with General Electric in 2007 to build nuclear power plants. Hitachi made a group net profit of ¥239 billion (about $2.75 billion) in fiscal 2010-2011, compared to a loss of ¥106.7 billion the previous year, on sales of ¥9.32 trillion. (about $110 billion). The increase was largely due to a return of demand for its electronics and automobile-related products. In the period from April 2010 to December 2010, Hitachi’s profit soared to a record ¥220.14 billion, compared to a loss of ¥111.34 a year earlier. Construction machinery and car parts sold well as did refrigerators and air conditioners because of Japan’s eco points systems. In March 2009, Hitachi named a new president---former vice president Takashi Kawamura---and said he was going to spin off it car parts and television operations into separate companies. Hitachi Proton Beam Hitachi, a sprawling conglomerate with 900 group companies that make everything from rice cookers to nuclear reactors, forecasts annual sales this business year of ¥9.5 trillion. It employs 360,000 people. Hitachi makes flat electrical transformers, mine detonators, air conditioners, refrigerators and household appliances. It is the world’s largest hard disc drive maker and Japan’s top electrical machinery manufacturer.Hitachi is a top maker of carbon anodes for lithium ion batteries. It also makes Shinkansen cars, switches for monorails and is a major maker of gas turbines. It made its first one in 1963 and delivered its 550th in 2009. It makes turbines for nuclear power plants and suffered when that industry was in a slump. It didn’t help either that two nuclear power plants in Japan were forced to shut down because of problems with Hitachi turbines. Hitachi invested heavily in flat-panel televison and is Japan’s second largest seller of plasma displays. Between 2006 and 2008 it tripled production to 300,000 panels a month, made plasma television for other manufacturers and hoped to sell 1.2 million plasma panels a year by 2010 but then suddenly announced in September 2008 that it would stop production of plasma television panels and buy Panasonic-made ones instead. By the end of 2008 only Panasonic and Hitachi produced plasma display panels (PDPs) in Japan. In 2007, Hitachi quit the home PC market and announced it world release the world’s thinnest LCD televisions---3.5 centimeters thick in 32,-inch, 37-inch and 42-inch models launched in 2008. Hitachi is developing atom-sized chip circuits with IBM and making elevators with Mitsubishi that can break the elevator speed record---reaching speeds of 1,300 meters per minute---and are looking for buyers in the Middle East. In August 2011 Hitachi said it would stop making televisions amid low profitability and stiff competition from South Korea and outsource instead. Sony, Toshiba and Hitachi are talking about forming a partnership to jointly produce LCDs. Hitachi has its fingers in a lot of different sectors and has ties up a lot of different companies. It is working with the Milwaukee-based firm Johnson Controls to develop lithium-ion batteries for cars; it has tie-up with a water service company to engage in water purification and other water-related projects. Hitachi and Panasonic have talked about tying up to make LCDs. In December 2010, Hitachi said it would build a railway parts plant in China with its partner there, Yonge Electric. It also building a sewage purification system in Chengdu in Sichuan Province that relies on microorganisms to remove nitrogen from the water rather than conventional methods. Hitachi won priority negotiating rights in 2009 to replace the 1,400 cars on Britain’s high-speed rail lines with new ones, a deal worth an estimated $11 billion, but that deal was put on hold when a new conservative government lead by David Cameron came to power in May 2010. In March 2011, it seemed the bid was back on track as the British resumed negotiations on the new train carriages, this time a $6 billion deal for about 100 trains. Hitachi and GE have formed an alliance to build nuclear reactors and were likely to receive a contract to build 1.5-million kilowatt economical and simplified boiling water reactor (ESBWR) for the Dominion Energy Company in Virginia. The two companies are also seeking orders for mid-size nuclear reactors in Southeast Asia that cost between $2 billion and $3 billion. The alliance between Hitachi and GE was a blow to Toshiba that had a relation with GE in the nuclear business that went back 40 years. The tie up with GE is seen by many analysts as a move by Hitachi to gain a foothold in the booming nuclear market in the United States. Reactor No.4 at the Fukushima nuclear power plant where meltdowns occurred after the March 2011 earthquake and tsunami was made by Hitachi. Reactors No. 1 and 2 were made by GE. Reactor No.3 was made by Toshiba. Hitachi and rival Toshiba are exploring the possibility of working together to decommission the reactors at the Fukushima nuclear power plant. Under the Toshiba plan it will take about six months to stabilize the reactors, five and half years to disassemble them and 10 years to dismantle the reactor buildings. Under Hitachi’s plan it will take about six months to stabilize the reactors, ten years to disassemble them and 30 years to dismantle the reactor buildings. Toshiba and Hitachi have mobilized 2,900 workers to work on the Fukushima nuclear power plant crisis. The 1,500 Hitachi personnel among other things have been injecting nitrogen into the troubled reactors and helped restore system for storing the spent nuclear fuel. Hitachi did decommissioning work at Chernobyl and Three Mile island. In July 2011, Hitachi announced that it had obtained preferred negotiating rights for an order to construct a nuclear power plant in Visaginas, northeastern Lithuania. It is the first time since the nuclear crisis at Tokyo Electric Power Co.'s Fukushima No. 1 nuclear power plant that a Japanese company has secured preferred negotiating rights for building a nuclear power plant overseas. Lithuania plans to start operating the new power plant in 2020. Hitachi’s new ABWR (advanced boiling water reactor) have enhanced safety features including ensuring backup power in the event of a major disaster, drawing lessons from the Fukushima crisis, and produces more electricity than conventional ABWRs. 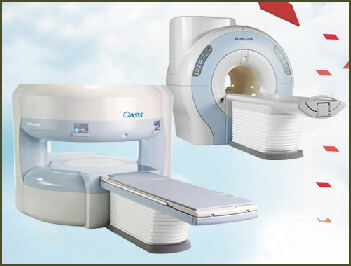 Hitachi MRI In recent years Hitachi has lost a lot of money, undergone extensive restructuring and laid off workers. It lost $320 million in 2006 and $580 million in 2007 and racked up $7.87 billion in losses in 2008. It a been hit particularly hard by a decline in demand for semiconductors and automotive devices and industrial machinery, its inability tp crack the flat screen television market, and restructuring costs. The company mulled over seeking government aid. Hitachi lost about $2 billion in fiscal 2009, less than the $7.9 billion it lost in fiscal 2008 and its forth year in a row of losses. In 2010, a new president, Hiroaki Nakanishi promised to turn the company around through oversees alliances and mergers. Hitachi returned to profit in April-June quarter of 2010 with a profit of ¥86 billion. Hitachi’s $7.9 billion loss in fiscal 2008 was its largest ever and was mostly blamed on stagnation in its semiconductor business. After that the company reduced cost by downsizing its workforce and unprofitable operations. In March 2011, Hitachi sold its hard disc drive subsidairy to the American company Western Digital Corp.
Hitachi was hit hard by the earthquake and tsunami in March 2011. Operations at three large plants, including its mainstay facility in Ibaraki, had their operations suspended. The disaster helped Hitachi is some ways. The company sold mid-size gas turbines and other equipment to utilities that run thermal plants that run on oil, gas and coal and needed to boost production. Hitachi and Toshiba have been accused by the E.U. on of running a cartel that fixed prices for gas-insulated equipment used by power utilities. Hitachi and Sharp were searched by the Fair Trade Commission on suspicion they colluded on setting prices on liquid crystal displays for Nintendo game handsets. In November 2008, Hitachi, Sharp, South Korea’s LG Display Co and Taiwan’s Chungwa Picture Tubes admitted to fixing liquid crystal display LCD prices and were ordered to pay a fine of $585 million by the U.S. Department of Justice. "Both Hitachi and Mitsubishi Heavy have a long history and it means their corporate cultures are very different and that makes an merger tough," said Mitsuhige Akino, chief investment manager at Ichiyoshi Investment Management. "They should aim for a full-blown merger and if they did, that would act as a catalyst for other Japanese firms," he added. A merger would create a $150 billion revenue infrastructure firm second only to General Electric and could provide the impetus for cost cuts, which are essential if the two companies are to cope with a strong yen and fierce global competition. According to Thomson Reuters data, a takeover of Mitsubishi Heavy, including its debt, could cost Hitachi around $28 billion, topping Softbank's $17.5 billion purchase of the Japanese unit of Vodafone Group in 2004. Both companies have struggled for years to make a profit. Hitachi made its first net profit in five years in the year ended March. Over the past decade it has lost an accumulated $14.3 billion compared to a net profit of $160 billion in the same period at General Electric. A key area in the discussions on infrastructure-related operations between the pair is nuclear power plants. A combination would give Hitachi, which makes boiling-water reactors, access to Mitsubishi Heavy's pressurised-water reactor technology, which has become the technology of choice for countries around the world. But for Mitsubishi Heavy, the advantage would be solely in the scale afforded by a combination, which could help it weather an industry downturn as nations around the world demand more stringent safety requirements in the wake of the Fukushima nuclear power plant crisis.